South Korea and the United States will wrap up their new, weeklong combined defense exercise on Tuesday, amid worries that the apparent downsizing of their springtime drills could hurt military readiness. The allies launched the Dong Maeng command post exercise on Monday last week, replacing the Key Resolve exercise to support ongoing diplomacy to denuclearize North Korea and foster lasting peace on the divided peninsula. Dong Maeng is the Korean word for alliance. The computer simulation exercise was half the duration of the usually two-week Key Resolve. It apparently focused on bolstering the combined defense capabilities with a counterattack portion of its predecessor removed. 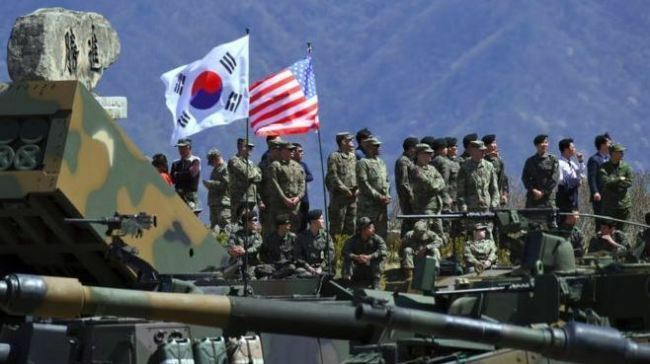 The exercise involved members from the South Korean defense ministry, Joint Chiefs of Staff and operations commands of the Army, Navy and Air Force, and those from the South Korea-US Combined Forces Command, US Forces Korea and Indo-Pacific Command. Despite the allies' decision to conduct the exercise on a smaller scale and in a low-key manner, the North's official Korean Central News Agency denounced it as a breach of its joint statements with Seoul and Washington aimed at enhancing bilateral relations. The reorganization of the springtime drills suggested the allies' desire to keep alive dialogue with Pyongyang despite the breakup of last month's summit between US President Donald Trump and North Korean leader Kim Jong-un in Hanoi. The second Trump-Kim summit ended without a deal as the two sides failed to bridge their gaps on the scope of Pyongyang's denuclearization and Washington's sanctions relief. The South and US plan to replace the Ulchi Freedom Guardian exercise, usually slated for August, with a new one as well. In the new summertime exercise, the allies are likely to verify Seoul's initial operational capability required for its retaking of wartime operational control from Washington. Following the IOC verification, they are expected to test Seoul's full operational and mission capabilities in the coming years.